The Annual Giving team reaches out to all our alumni, donors, employees and friends of the university to promote the scholarships, bursaries, and initiatives that support our current and future students and better our community. With your donation, you can support any fund at the university, whether it’s the library, athletics, the alumni fund, or any faculty initiatives and program. Learn about our priorities. Every gift at any level makes a difference. Participation is what counts! Please visit Impact of giving to see how UVic's annual donors are making a difference. 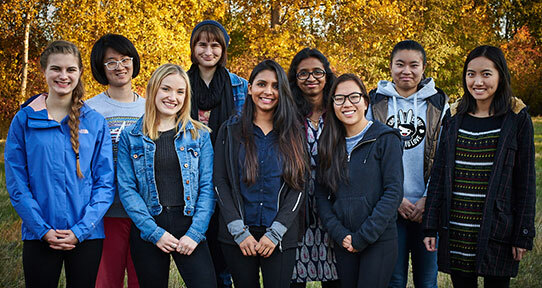 Located in the Alumni House, the Annual Giving’s Student Calling Program is where current students connect with all alumni - from Victoria College graduates to this year's graduating class. We have 25 current undergraduate and graduate students who spend their evenings speaking with alumni each term. UVic’s faculty and staff are well known for supporting student success, and for supporting the dreams and goals of the next generation. With the financial challenges we are facing as a campus community, it makes philanthropic support more important now than ever before. Please contact Danielle Mulligan, Annual Giving Officer, with any questions regarding fundraising for, or donating to, a fund at the university. Learn about our priorities for faculties and divisions. If you feel you have different priorities, contact us and we will work with you to find a suitable fund where your gift can help.